And below is a bit of commotion from the second day, just to give an idea of how intense the environment was. We slowly built up to this level so that we could always be successful at each step. Wendy, our barn manager, is describing some of the stuff that’s going on. There were 12 of us all together, which by itself made for a lot of commotion. The dragon is off to the right behind the scary bubble machine. It had a glowing red fabric tongue that floated out from its mouth. Charm stood there and let it bump against her nose. In the video Charm and I are standing in the middle of the ring. She’s the chestnut with the crooked blaze. I am the only one wearing a helmet for ground work the second day. And glad I was–there were a lot of excited whirling horses out there, along with owners who were concentrating so hard on their horses they forgot they were not the only creatures out there! This is Desi, not Charm of course. But the capture of the bubbles is perfect. This bubble machine was the bane of almost every horse. Charm hated it, but eventually managed to walk through the bubbles if she could keep about 5 feet away from the actual machine. It was even worse when the bubbles began to stack up in a mound on the ground. 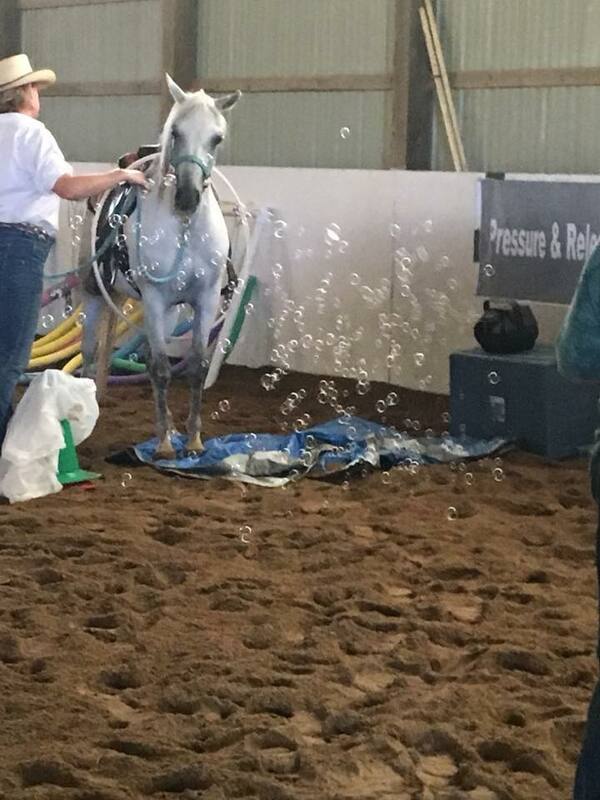 You would think that Michigan horses who had been around snow all their lives would not be intimidated by a few bubbles blowing around and landing on the floor. But they all must have gotten together and agreed that these weird floating things didn’t belong in the indoor arena. Leading Charm “from behind” through the pool noodles. On the first day we started with the most preliminary of basics, learning to get control of the horse’s shoulders and hips on the ground. In order to be safe, we have to be able to quickly and easily move the front end and the back end of the horse where we want it to go. 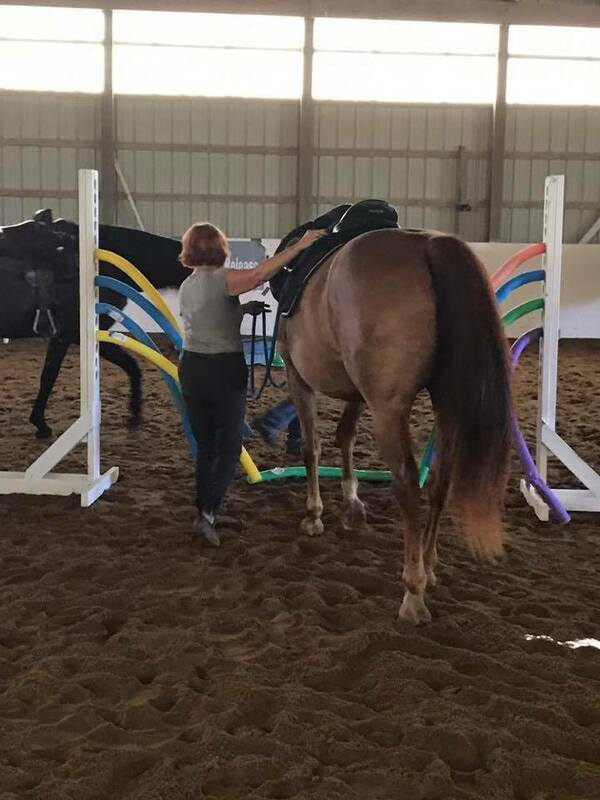 We also have to teach the horse that we humans have a personal “space bubble” that they are not allowed to enter unless invited; this will keep them from pushing into our space if they get anxious. Once these ideas were presented, we worked on them and then went on to the concept of “leading from behind”. The purpose is to make it the horse’s idea to negotiate the obstacles. We could lead them as most people do from the front, but if we do then they are following us and not building their own sense of courage. We open a generous loop of lead rope to the side, inviting them to go through the “door” we have created, while keeping our own bodies back at the saddle area with the other end of the rope over the saddle or behind the cantle, depending on how well we’re negotiating the route at any point. If we get stuck at an obstacle we can always give a little twirl with the end of the rope from behind to get the idea of “forward” across. We always encourage from behind, not pulling from the front. By presenting all the obstacles from the ground, the horse learns to negotiate them by himself and will be more willing to do the same when we ask from the saddle. Charm heading down the teeter totter after it shifted sides. Charm negotiated the teeter totter a lot better from the saddle than from the ground. It took a few passes on the ground to convince her to stay on the bridge–she seemed to think that she could just leave it at any moment. Which she could have, but that wasn’t the point! The downside to that was she threw a shoe coming off the edge. However, it didn’t mess up her hoof and the arena sand is quite soft so we carried on minus a right front shoe. 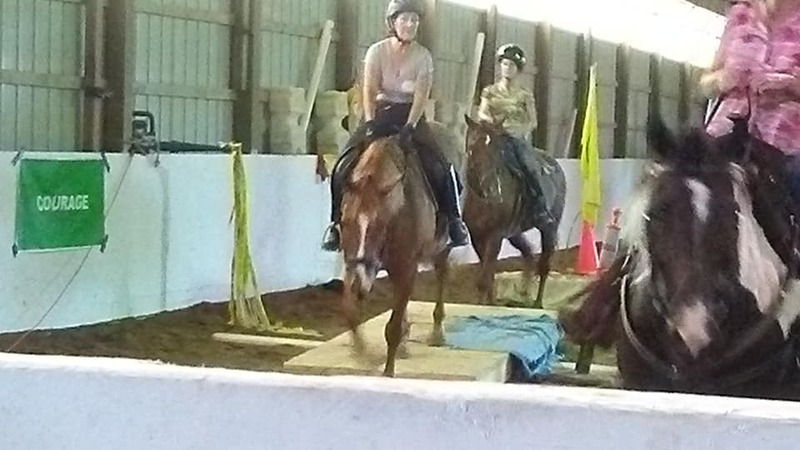 When we mounted up, the obstacles were in a path along the ring walls and up through the center line. Sara taught us the basics of mounted patrol drill team commands and had us ride in single file and sometimes pair formations. She also wanted us to keep a distance such that we could see only half of the tail of the horse ahead of us through our horse’s ears as we went over the obstacles. That got quite interesting as we passed over the teeter-totter because the horse ahead wasn’t always clear when the next horse stepped on. I think Wendy missed that part of the instruction, but here’s a clip of her making fun of us for “cheating” by stepping on the bridge too soon! I guess that’s the tradeoff for her services as an unpaid videographer. Final evaluation of the two-day course: Worth every last penny! Highly recommend! This entry was posted in horses, riding clinic, trail riding and tagged horses, willow tree. Bookmark the permalink. That looks really neat! I’m sure that my mare would have catapulted me into the rafters, but it sounds like your mare handled everything really well. Your mare would have figured it out along with you–everything was done simple step by step, no forcing, no over-facing. The really important part is for the rider to stop having a fixed goal, as in “we MUST get past this scary object”. If you get even a couple of steps forward, that is progress. Then you stop, reward the horse (usually with a little scratch on the withers which is soothing to them), and try for a step or two more. Bit by bit. No impatience allowed! I knew Charm was never going to walk between the flares, but she got up to two feet away from them without going berserk and that was good enough for me. Wow…that was great! Every horse that is ridden should have to go through this course. Thanks for sharing this. It really taught us to work patiently with the horse and let the horse discover the reality of the obstacles instead of being pushed into them. 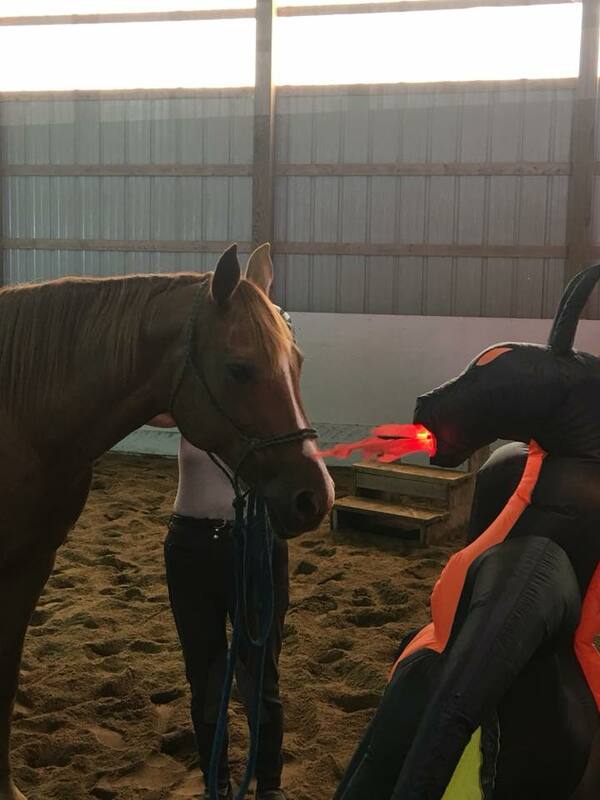 Sara would occasionally step in when a rider was doing ground work and getting it so messed up that the horse, rather than really being afraid, was just taking advantage of an opportunity to engage in avoidance. A little flap of a flag in the air around the the hindquarters or a couple of snaps on the shoulder with the end of the lead rope usually got the horse’s attention and got things back on track. Sara told Charm no, you don’t get to wander off the line and barge into your owner, and Charm said “yes ma’am” and when I took over there was no more issue. It was mainly a case of me not being crystal clear in the first place. What a wonderful opportunity! I’m glad to see the obstacles and the approaches, as we often have these types of clinics here. But, I see where we can learn something from this one! Good job Charm and Alli!